Volatility is about change and unpredictability. A volatile chemical will evaporate quickly. Knowing a volatile person means not knowing well what he or she will do next. Income volatility is an emerging, critical issue for understanding financial security today. American households seem to be facing increased instability and unpredictability in their financial lives. Despite the efforts of scores of researchers, there is no consensus on the extent of volatility and how it affects individual well-being, especially among vulnerable low- and moderate-income populations. For that reason, the Aspen Institute Financial Security Program (FSP) is devoting the inaugural year of its new knowledgesynthesis initiative, the Expanding Prosperity Impact Collaborative (EPIC), to income volatility. EPIC aims to be an evidence-based, neutral forum for gaining clarity about the nature of the problem, its evolution, its significance, and our options for responding. This issue brief – built on a comprehensive literature review by Aspen FSP staff – is a first step, designed to provide a common frame of reference and facilitate a shared understanding of existing evidence and directions for future research. Additional information on each claim in this brief, as well as sources, can be found in the Endnotes. This brief focuses on the prevalence, causes, and impacts of volatility; a future brief will look at how households cope, and what policies and products can do to mitigate volatility and its effects. Volatility is about change and unpredictability. A volatile chemical will evaporate quickly. Knowing a volatile person means not knowing well what he or she will do next. Volatility in financial parlance usually refers to how much an asset’s value fluctuates from its general trend; high volatility equals greater uncertainty about what the value will be tomorrow or next month or next year. Think of the typical household as a firm with financial statements. An income and expense report would track what is coming in from earnings and benefit payments (and perhaps interest or other returns on investment) and what is going out in expenditures for today and payments on long-term obligations (perhaps a mortgage or student loans). There would also be a balance sheet of what is owned and what is owed. When those hypothetical financial statements are in flux – especially when the changes are unwanted, frequent, or unpredictable – the household finds itself on shaky economic footing. It experiences volatility. In the context of household finances, volatility is usually defined as the variance of income, meaning the amount of divergence from the average. It can also be measured by the number of substantial spikes and dips in income over time. "High volatility means more uncertainty about what the value of an asset will be next month or next year." VOLATILITY OVER WHAT TIME PERIOD? Volatility is a measure that can look at change over any period of time. Researchers have historically analyzed income and consumption changes over decades or even lifetimes. More recently, academics have examined changes from year to year. Only in the last few years have researchers begun to focus on fluctuations over shorter time periods, such as monthly, weekly, and even daily. Numerous studies have looked at how much individual and family income shifts from year to year, and how that has changed over time. Most studies – though not all, as a function of differences in data and methodology used – have found increasing income volatility for American households in general since the 1970s. For example, the share of all households experiencing a negative annual income shock of $20,000 or more increased by 23% between 1991 and 2004. The increase in volatility has been highest for households at each end of the income distribution (both low-income and top earners). The trends vary somewhat when looking at specific groups. For example, males (in particular black male household heads) have seen increasing volatility since the 1970s. The evidence is more mixed for women, although there is observed growth in volatility for female-headed households. There is particular prevalence among low-income households, black families, and single parents. Nearly half of all households experience an income gain or drop of more than 25% over any two-year period. Roughly one-quarter of individuals can expect to see even larger changes – 50% or more – from year to year. When the economy was seeing earnings generally rise over time, the income changes tended to be more on the positive than negative side; however, as wages have stagnated, the incidence of losses has become roughly equal with gains. Because drops are more associated with hardship, this shift contributes to the heightened concern about volatility. Variation in income from month to month has received less attention, but one study found that such intrayear variation increased by 11% between 1991 and 2003. Intrayear volatility is especially high among low-income households, and the trend line upward has been especially steep for them. Among people living below the federal poverty line between 1991 and 2003, the increase in volatility was 31%, and monthly volatility was 88% higher for those in deep poverty (defined as less than 50% of the federal poverty level). There is greater intrayear income volatility among those receiving food or cash assistance and among those in households in which the head did not complete high school. One major reason why there has been less attention on intrayear income volatility is that month-to-month income data is not widely available. For example, the Panel Study of Income Dynamics on which many volatility studies rely originally interviewed participants annually, and more recently just every other year. An annual time frame can mask the incidence of considerable month-to-month variation (see Figure 1); for example, someone with a steady annual income who makes that money mainly in the spring and fall experiences considerable volatility. Researchers have in recent years employed new methodologies to dig into intrayear variability. The Federal Reserve’s 2013 Survey of Household Economics and Decisionmaking found that 21% of respondents experienced some unusually high or low income months, and an additional 10% reported their income often varies “quite a bit” from one month to the next. The U.S. Financial Diaries’ year-long study of low- and moderate-income households revealed that the households experienced on average five out of twelve months with a change in income of over 25% (roughly split between rises and falls). 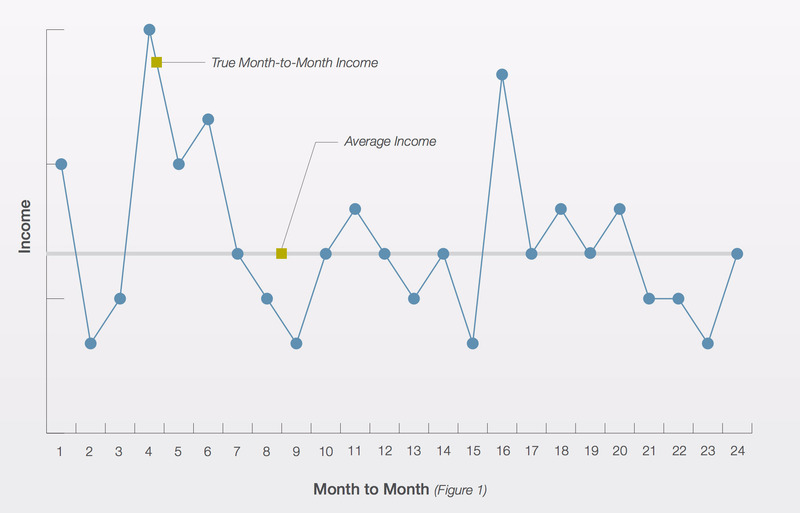 Using proprietary data, the JPMorgan Chase Institute observed that between 2012 and 2014, four in ten individuals saw more than a 30% month-to-month fluctuation in income. WHAT CAUSES INCOME VOLATILITY? WHY WOULD IT BE BECOMING MORE COMMON? Researchers have identified numerous sources of income volatility (whether annual or intrayear). The relative importance of these is unclear, meaning that more research is needed to understand causation. Household income has three components – labor market earnings, non-labor transfers, and household composition – each of which can be unstable. The most obvious jolt to income from earnings comes from involuntary job loss, which may stem from employer actions (such as layoffs) or from personal circumstances (illness or disability). It may be complete or partial (a reduction in hours). Disruptions seem to have become more common over time as employers increasingly demand flexible labor and as the “on-demand” economy has grown. For workers with high skills or control over their hours, this can mean increased freedom as well as increased ability to mitigate volatility by supplementing income when needed. However, for lower-skilled workers and those with little control, increased flexibility equals unpredictability and income volatility. Low-wage jobs with steady recurring income are surprisingly rare. "Over 40% of Americans who report variable monthly income blamed an irregular work schedule for the swings." The increasing demand for flexible labor itself has a number of possible root causes. Some of these do not necessarily suggest a directional trend: volatility is quite sensitive to business cycles, and certain industries (such as agriculture and wholesale and retail trade) are inherently more sporadic. Other causes of demand for more flexible labor appear to be associated with underlying structural and political changes: employers are experiencing greater volatility in sales and are passing this through to their employees, and a decrease in unionized workplaces reduces standardization of practices. The degree of variation in annual hours worked has increased over time. Of equal significance is the variability and fluctuation of hours worked on even a daily basis. Over 40% of Americans who report variable monthly income blamed an irregular work schedule for the swings. This is true for full-time hourly work, but has an even greater impact on part-time work (which became more widespread during the Great Recession and remains at heightened levels) and temporary or seasonal jobs. Around half of the low-wage workforce is subject to precarious scheduling (such as lack of input on the hours to be worked and little advance notice of shift changes or cancellations). The independent contracting that comprises the growing “gig” economy is defined in part by scheduling irregularity and unpredictability. Most self-employment is associated with highly volatile earnings in terms of both earnings per hour and hours worked. Some workers can tolerate this better than others. However, some limited evidence indicates that flexible access to additional income through online gigs serves as a cushion against dips in other earnings. How one is paid for hours worked matters. Five-Friday months and year-end bonuses contribute to month-to-month volatility. Performance-based pay (which may be associated with the decline in union bargaining power) can result in variable bonuses and commissions year-round. Wage theft – not being paid for hours worked – is another source of unpredictability and instability, especially for day laborers and some other low-wage workers. For many, household income relies to some extent on public benefits or transfer payments. Some of these benefits are means-tested cash or voucher assistance for which eligibility is determined by income or other indicia of need (for example, the EITC-Earned Income Tax Credit, SNAP-Supplemental Nutritional Assistance Program, Housing Choice). Other payments constitute social insurance for which eligibility is determined by having previously paid into the system (such as Unemployment Insurance or Social Security). Many transfer payments are interdependent with labor income, so they can to some extent replace earnings and cushion some instances of volatility (e.g. a laid off worker can become eligible for Unemployment Insurance and SNAP). However, benefit programs are not typically responsive to short-duration shifts in income and cannot mitigate that instability. Eligibility criteria can have perplexing effects from a volatility perspective. For example, a reduction in hours may make someone eligible for a larger EITC, but a complete loss of work can result in no EITC. “Benefit cliffs” – where $1 additional income can result in complete loss of assistance – are themselves a source of income volatility. "Benefits programs are not very responsive to short-term shifts in income, and thus cannot mitigate volatility caused by illness or shifts in seasonal work." Modifications of benefit structures and eligibility requirements in recent decades have also made transfer income more volatile. Unemployment Insurance coverage has diminished, and it does not offer any assistance to those with the most fluctuating earnings (such as seasonal workers). The 1996 law that “ended welfare as we know it” shifted many low-income families from the relative stability of monthly benefits to the variability of labor income supported by tax credits and other work-based assistance. Increased reliance on the tax code for administration of income supports – principally the EITC but also the Additional Child Tax Credit – has greatly magnified a source of intrayear volatility: the once-a-year lump-sum tax refund. Refunds have long been used enthusiastically as an income shifting device through the forced savings mechanism of overwithholding. Now, fulltime minimum wage workers supporting large families receive a refund equal to more than half of their annual earnings. Interestingly, many volatility researchers focus on pre-tax income to avoid the skewing effects of tax refunds, yet taxpayers experience refunds as a volatility spike. Income volatility is affected both by changes in individual earnings and changes in household income. Over the last several decades, household income has changed due to the addition of earnings from women in the labor force. The fact that more women work today does not appear to explain the growth in overall variability, however. Among married couples in which each is working, there is less volatility, though there is evidence that the presence of a second earner does not provide the same buffer it once did. Changes in family structure can cause harmful disruption and volatility in income flows. A wage earner may leave the family due to divorce or death. Welcome household events – such as marriage or birth – can destabilize income. As children grow up and parents age, care needs can shift (sometimes unpredictably) and affect earnings. While the likelihood of these life events does not seem to have increased over time, the extent to which they destabilize a family’s balance sheet has grown. WHAT ABOUT VOLATILITY ON THE EXPENSE SIDE OF THE LEDGER? Both sides of the household income and expense statement can fluctuate. What one spendsis affected by what one has. There is also expense or spending volatility independent ofhousehold resources: prices go up, new needs arise, calamities occur, choices are made. For a household, both sides of the ledger matter. Pew’s Survey of American Family Finances – one of the new sources of data related to volatility – uses the lens of financial shocks, which can result from either a dip in income or a spike in expenses. Household consumption fluctuates considerably. Between 1970 and 2004, year-to-year volatility of household food consumption increased overall by 21% and was greater than that for non-white and less-educated households. As with income, expense volatility is highest at the top and bottom of the income distribution, though Pew found that for every additional $10,000 in annual income, the likelihood of experiencing a shock decreased by 0.5 percentage points. The effect of shocks on financial security is greater for low-income households than high-income households and greater for African-Americans and Hispanics than for whites. "Between 1970 and 2004, year-to-year volatility of household food consumption increased overall by 21% and was greater for non-white and less-educated households." Income and expense shocks often do not match up. The JP Morgan Chase Institute study found consumption volatility was higher than income volatility by 5% to 30%. The low- and moderate-income households in the U.S. Financial Diaries averaged around two spending spikes and two spending dips over twelve months; 61% of the spending spikes were not associated with an income spike, and 33% of them occurred when income was below the household’s average. A variety of unexpected events generate expense spikes: malfunctioning cars, appliances, or housing infrastructure; illness, infirmity, or death (both people and pets); commodity price increases; or needing to move. There are also spikes associated with predictable occurrences, such as tax bills and holiday spending. Spending also has a psychological element, which can blur the distinction between the unexpected and the predictable, and accentuate instability. WHY DO WE NEED TO BE CONCERNED ABOUT INCOME VOLATILITY? Income volatility exacts financial and non-financial costs with both immediate and long-term consequences. Volatility would not be particularly worrisome if households were able to perfectly smooth consumption – by, say, saving, budgeting, borrowing, or insuring. But volatility has been found to delay and disrupt important household consumption, especially among those households with high levels of debt. Volatility also increases the risk of living in poverty and experiencing food insecurity. Intrayear volatility complicates a household’s ability to access safety net programs. Fluctuation can lead to utility disruptions and housing instability. It may hinder the ability to obtain and maintain appropriate health care. There are also volatility generated expenses such as late fees and higher financial transaction and credit servicing costs. Economically unstable households sometimes rely on unsafe and predatory financial products that have their own destabilizing consequences. Income volatility can wreak havoc on household balance sheets as it disrupts the ability to make ends meet. Not only do savings not accumulate, but they can be depleted through actions such as raiding retirement accounts. Recent experience shows that the racial wealth gap exacerbates these disruptions for African-American and Hispanic households. On the liabilities side, an economically unstable household will often incur additional debt. Intrayear volatility can mean that a year in which a household’s total income exceeds total expenses still includes a few months of living in poverty, and this can have negative long-term consequences if short-term coping involves disposition of assets or unreasonably heightened risk aversion. Most people inherently value steadiness and security. Both the Pew survey and the US Financial Diaries found an overwhelming majority of households preferring stability to moving up the income ladder. Volatility undermines feelings of financial security, generating stress, anxiety, and even depression. It is cognitively taxing. This leads to worry and pessimism about the future and tends to undermine planning. Financial instability can lead to family instability and negative impacts on health. Of particular concern are harmful non-financial effects of income volatility on children. Studies are just beginning to focus on these questions, but initial evidence suggests that parents facing economic instability can be less involved and less consistent in child-rearing. There can be behavioral problems, reduced mastery of skills, and low self-esteem that hinder educational attainment. As adults, affected children may see reduced earnings and experience volatility themselves, almost as if it were inherited. Of course, families develop their own tools to manage volatility. And the marketplace provides a wide array of options, some more useful than others, that facilitate income and consumption smoothing, including credit cards, payday loans, and mobile budgeting apps. The role that households, the financial industry, the technology sector, and government can play to mitigate volatility’s worst effects will be the subject of a second, forthcoming EPIC brief. WHAT DO WE NOT YET KNOW? EPIC’s look at income volatility includes identifying questions that deserve further explanation. Four areas of inquiry stand out. The observed increased swings in household expenditures have likely been influenced by increased income fluctuations. However, the costs of some line items in household budgets – such as food, health care, housing, and transportation – have fluctuated significantly for most. To what extent is this the source of the growth in household economic instability in recent years, and what are the implications for addressing the negative effects of income volatility? Some researchers focus exclusively on income drops since they clearly have more dire consequences than spikes. This brief examines changes in both directions, under the assumption that large, unexpected gains can present families with difficult cash management decisions in their own right. But do sudden gains deserve as much attention as sudden declines? Can understanding how households react to income spikes help inform the development of products and policies that allow families to better cope with downturns? On the one hand, classical economic theory posits a potentially positive relationship between microeconomic (household-level) volatility and macroeconomic growth as dynamism and creative destruction lead to greater efficiency and productivity. Is the income volatility observed today a necessary byproduct of a vigorous and healthy economy characterized by rapid technological innovation and globalization? If so, how can negative household-level effects be ameliorated without undermining growth? On the other hand, volatility causing financial stress can be a drag on worker productivity potentially affecting the larger economy. Volatility that fuels consumer debt acquisition and diminishes savings can lead to “balance sheet” recessions such as the one from 2007 to 2009. Families constraining consumption or avoiding risk could impair macroeconomic demand and vitality. Could the ripple effects of income volatility through households coalesce into precarious waves that destabilize the larger economy and threaten growth? Are the same households affected by income volatility – whether annual or intrayear – year after year, or is the incidence widely distributed across the population? For those subject to repeated volatility, does it come from the same source again and again, or are the causes more varied? Among workers experiencing intrayear volatility, what is the breakdown by proximate cause (for example, seasonality, incentivized pay, week-to-week variation in hours, etc.)? Studies to date have not been able to discern these more finely-grained characteristics. This issue brief is the first step in EPIC’s process to understand better the challenges income volatility poses to the financial security of low- and moderate-income Americans. 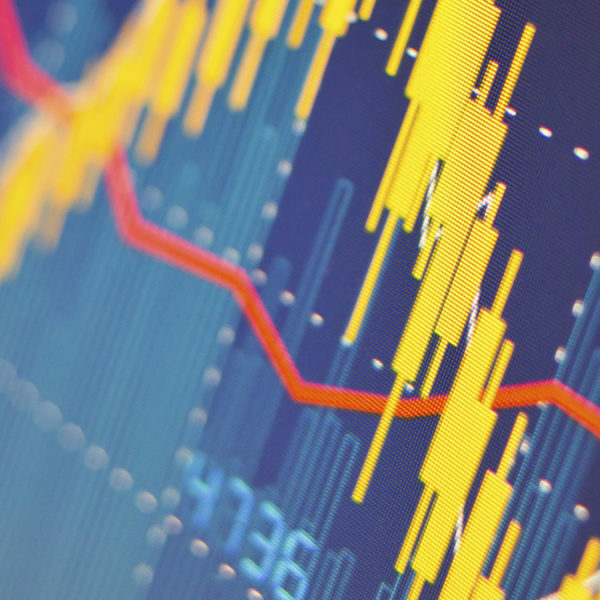 A March convening of researchers from academia, government, and industry refined a shared understanding of the incidence and impacts of income volatility, identifying both areas of consensus and some disagreements. A wider group of experts simultaneously considered these issues via an online survey, and EPIC will soon distribute the combined results. In June, a second convening and an additional online survey will examine what individuals, governments, and financial service providers can do to help families mitigate volatility’s worst effects and reduce the incidence altogether. EPIC’s final report on this topic later in 2016 will share the knowledge-synthesis. For Endnotes and Works Cited, as well as more information on FSP and EPIC, please download the PDF version of this Issue Brief. EPIC would like to thank Steve Holt of HoltSolutions for synthesizing the research literature and writing this brief; David Mitchell for analyzing and categorizing the research base, and coordinating the research, writing, and editing processes; Judith Garber for immense research and editing assistance; Ida Rademacher, Joanna Smith-Ramani, Michael Collins, Susan Lambert, Tim Ogden, and Rachel Schneider for reviewing drafts and making invaluable suggestions; the additional members of the EPIC Advisory Group – Marla Blow, Maureen Conway, Scott Cooley, Fiona Greig, Darrick Hamilton, Chuck Howard, Elisabeth Jacobs, Kevin Jordan, Jonathan Morduch, and Caroline Ratcliffe – for providing feedback on an early outline; and Laura Starita and Tim Ogden at Sona Partners for designing and producing this brief. None of EPIC’s work, including this brief, would be possible without the generous support of the Ford Foundation, JPMorgan Chase and Company, the Metlife Foundation, and the W.K. Kellogg Foundation.